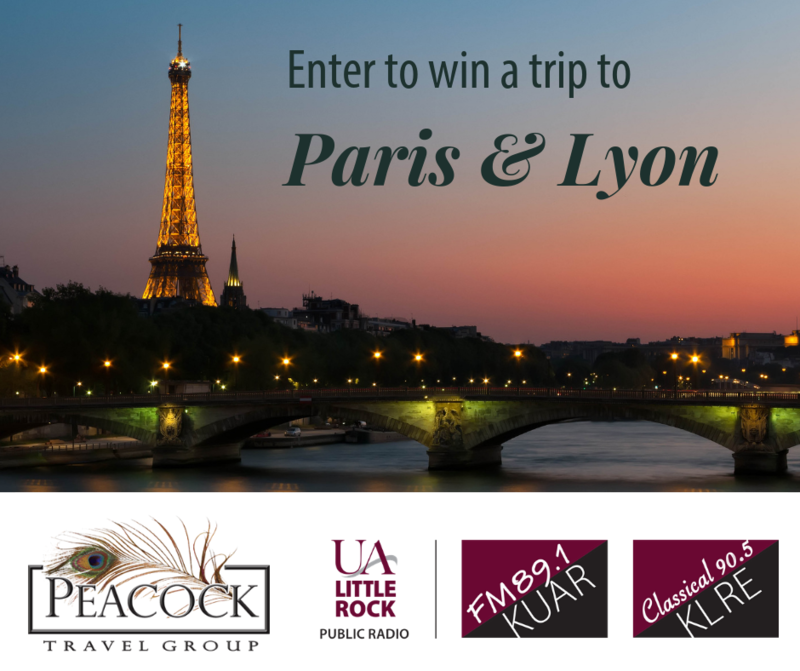 Enter the current KLRE/KUAR drawing - you could win a trip! Submit your entry between the hours of 6:00 AM on March 21, 2019 and 11:59 PM on Wednesday, April 10, 2019 Central Standard Time. Entries by mail must be postmarked by Wednesday, April 10th to qualify. You are automatically entered into any current, active drawing announced during the drive when you donate. One-time gifts are applied to any current drawing at the time they are received by phone, web pledge, or mail. While no pledge is necessary to enter, please remember that your financial support is key to the quality of UA Little Rock Public Radio – KUAR and KLRE. Monthly sustaining members are automatically entered into all announced UA Little Rock Public Radio drawings without need to re-enter. 1. No pledge is necessary to enter. 2. You must be eighteen years or older to enter. 4. UA Little Rock Public radio personnel and immediate family members, UA Little Rock faculty and staff and immediate family members are not eligible to win. 5. For any drawing that includes airfare, flights must originate in the continental United States. 6. For any drawing that requires travel, the trip dates are non-negotiable. 7. The prizes are not redeemable for cash and are non-transferable. 8. The odds of winning depend on the number of entries. 9. The winner is solely responsible for any tax implications of winning the prize. One winning name and three back up names for the drawing will be selected by random drawing no later than April 19, 2019. If any winner is unable to collect their prize or does not respond to the notification within 30 days, the unawarded prize will go to the first back-up and subsequent back-ups thereof until prize is awarded. The chances of winning are dependent upon the number of entrants. Winners’ names will be kept on file at UA Little Rock Public Radio and will be available by writing to 5820 Asher Ave, Suite 400, Little Rock, AR 72204. Except where prohibited, acceptance of a prize constitutes winners’ consent that his or her name, likeness, voice and/or biographical data may be used for advertising and promotional purposes without reasonable limitation and without additional notice, compensation, or consent.